As I write this the bright winter sun is streaming through the living room windows giving the room a golden glow. Outside, high up in in the red oak where a past storm tore off a large branch exposing the hardwood to insects, a pileated woodpecker taps loudly as it searches for a late day meal. On the south facing hill below that, several dozen robins root among the thick blanket of dead leaves searching frantically for a meal to fight off the cold. They hop from spot to spot, grabbing leaves with their beaks and toss them aside hoping to reveal a worm within the warm, decaying matter. They don't stop moving; I wonder if they stay in motion in an effort to keep warm. 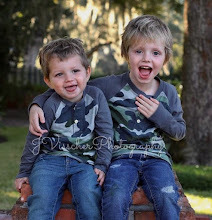 Nevertheless, many chirp that familiar song that often accompanies the blooming of daffodils. It wasn't but a couple of days ago that it seemed spring was overtaking winter with temperatures in the 60's and friends texting me to leave the office to go wet a line. There was no fishing this weekend, but we have done plenty of fly tying and thinking about warmer days and rising trout. The shows are over, the last one being Lancaster a week ago, and that was a great time as usual. 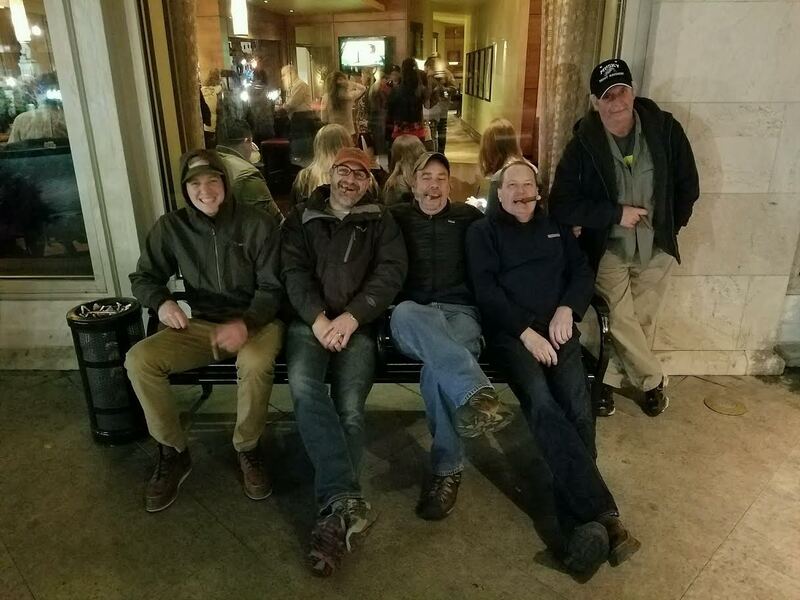 Before I get to the fly tying, here's a shot of me and some of the hoodlums that sit along fly tyers row on the show floor enjoying a cigar after Saturday dinner in Lancaster, PA.
With opening day in New Jersey and Pennsylvania being about a month away, we are tying flies in anticipation of warmer weather, hatches, and rising trout. Below is a Hendrickson Sparkle Dun that I tied today, as we typically see these mayflies hatching around opening day in NJ and PA. They hatch later in the month of April in the Catskills and Delaware system. I also tie these with a snowshoe rabbit foot wing; both work well for these early season mayflies. 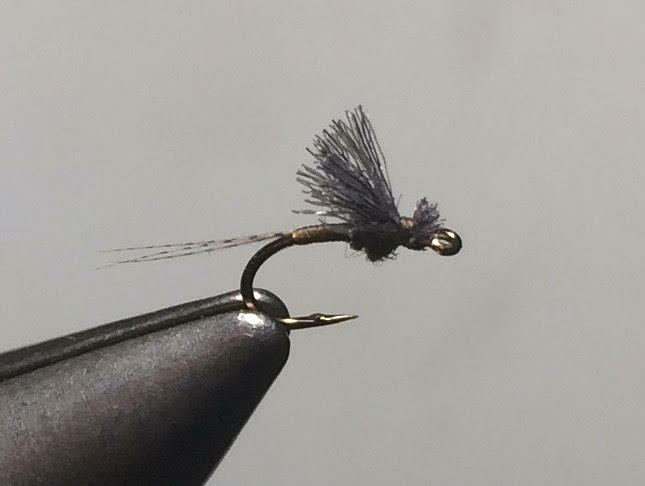 And of course, we are tying several versions of blue-winged olives, as these little flies are abundant and often the only mayflies hatching in early season. 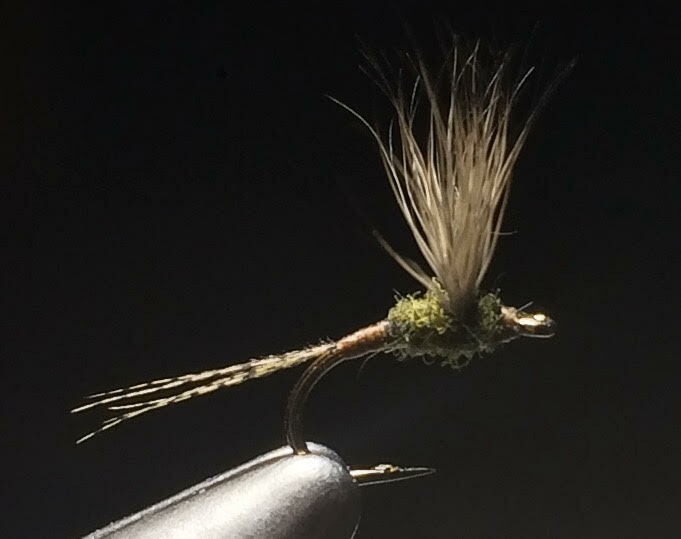 This is a variation of the Comparadun; woodduck flank tail, thread abdomen, tied on a size #20 emerger hook here. 6/0 olive Danville thread, don't leave home without it. 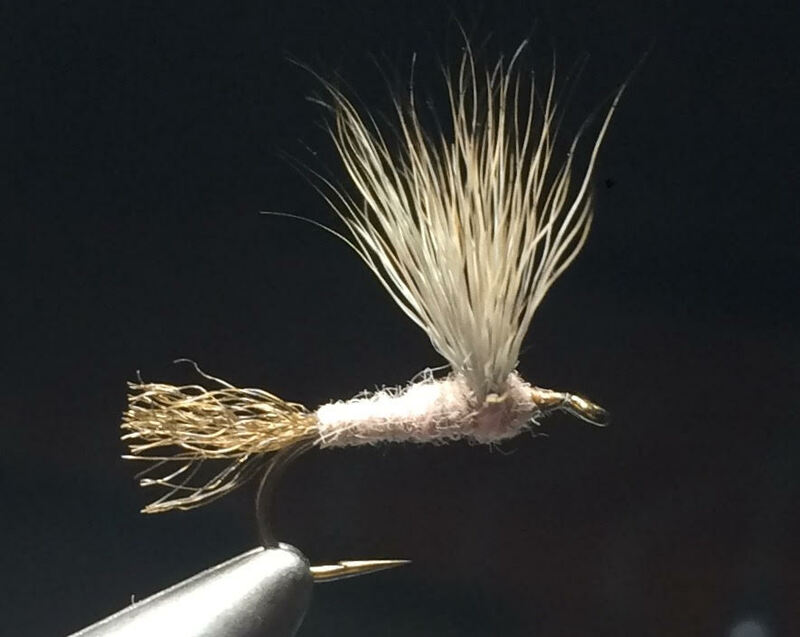 And here's a new pattern designed by Bucky McCormick of Blue Ribbon Flies in West Yellowstone. It's called an Almost There Baetis, and imitates an emerging blue-winged olive. The tail is woodduck fibers, thread abdomen, small dubbed thorax, and grey EP trigger fibers for the wing; also tied on an emerger hook. Tie some up and fish them with confidence. And finally, there's a new Atlantic Salmon fly rocking the crusty fly fishing world called a Jock Mop! Look for details in a future post.